I won’t lie, I’m feeling chuffed about our progress in less than a month! First, let me take this opportunity to announce that our new Podcast is officially a Podcast. You can find us on iTunes and Feedburner. So, about this Google ranking, I’m pleased to announce that moving forward you can expect to see a better-quality feed for our live broadcasts, and better coordination of those events. I won’t lie, there have been a few learning curves for me with this project over the last couple of weeks. One would be that I have a terrible tendency to touch my beard while in a discussion, but better than that; YouTube Live events! Despite many years of video production experience, especially video for the web, I’d never launched a YouTube channel. I’d heard about the preference Google was giving for scheduled live broadcasts on YouTube. Unfortunately, I had some syncing issues between Wirecast and my booked Events, in that the event would sit waiting while the broadcast would open a new Live event. Plus, it wasn’t auto starting and stopping so I had to do that manually. Point is, reverse-engineering MAY work and Google definitely prefers scheduled live events! The test was a repeat of episode 3 with a slightly modified title: “Should Businesses Avoid Facebook Now?”. 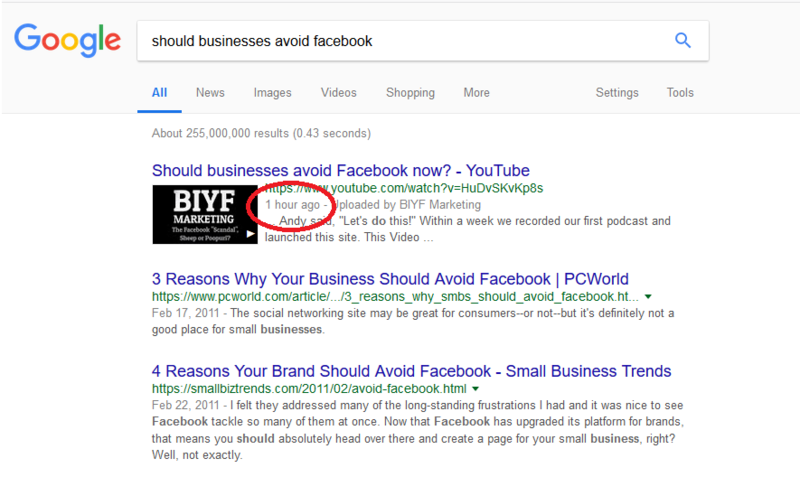 Within an hour, simply “Should Businesses Avoid F..” ranked #1 and so far, is holding #1 under Videos. ⟵The Facebook “Scandal”, Sheep or Poopuri?